Colleen Mullaney, the author of the popular party guide Punch, returns with a book created for traveling the world—one cocktail at a time! 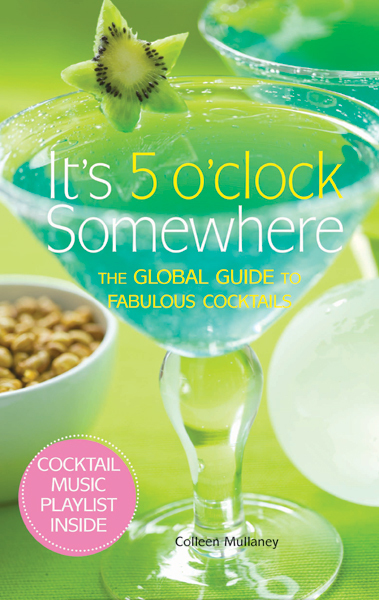 It's 5 O'Clock Somewhere: The Global Guide to Fabulous Cocktails features 60 world-class cocktail recipes and is truly the perfect book for entertaining in style. Traveling from city to city around the world, the book not only spotlights fabulous global watering holes, but also showcases each region's quintessential cocktail. With every cocktail recipe, there are fun facts about the drink or country of origin, bar snack selections, and suggested music to really liven up your party. Special extras include a complete It's 5 O'Clock Somewhere music playlist downloadable on iTunes. With vibrant, full-color photographs of each cocktail, lively descriptions of exotic locales, and helpful tips, terms and mixology secrets, it's easy to making your cocktail party a night to remember, It's 5 O'Clock Somewhere is a must-have for your own shelf and the go-to party or hostess gift this season.